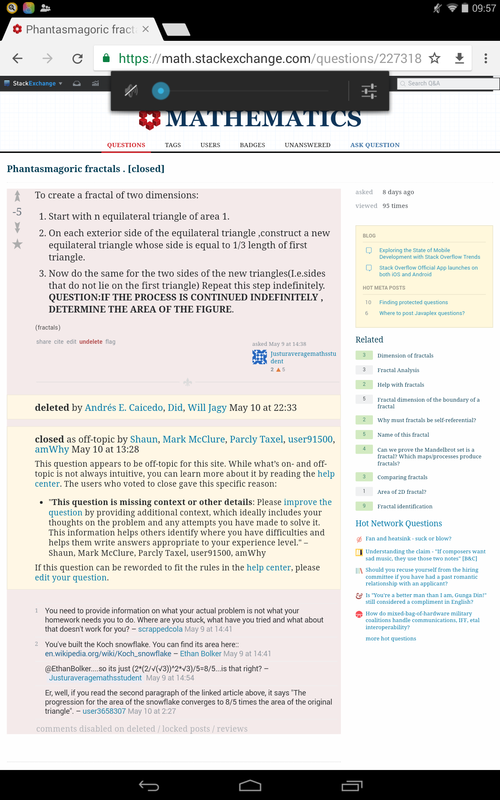 I have a question about my Mathematics Stack Exchange post: Phantasmagoric fractals . I voted to close that question because, as Jonas indicated in his comment, I felt that the question lacked context. More generally, I think that any question that appears to be just a statement of a problem from a classroom without any indication of where it came from should be closed for that reason. Quite a few folks active on the site hold a similar view, though there is some variation. Here is some additional context that might help: What subject matter are you studying? Perhaps you're studying sequences and series, as they can be applied to problems of this nature. Or maybe you're studying Fractal Geometry specifically? Is it from a class? If so, what class? Perhaps you found it in a book that you're reading independently? All this information helps a respondent converse with you at the appropriate level. Also, lacking that context, the problem might appear to be a homework question that might be due for points. Many here don't want this site to be used for cheating on homework. As I said, there is some variation on this theme. Some folks think it important that you type out any work that you've done. While I certainly think it can help to indicate what sorts of techniques you think should be applied, I also think this can be easily overdone. Indeed, too much work (which might or might not be correct) can easily muddle the question. Finally, the title "Phantasmagoric fractals" is not at all descriptive and rather sophomoric. I clicked on it because I'm interested in fractal geometry but, based on the title, I wasn't surprised that I ultimately voted to close it. Having said all that, I will point out that you did receive a pointer to a rather complete answer in the comments so I hope you found that helpful. Not the answer you're looking for? Browse other questions tagged discussion specific-question on-hold-questions . Why was this on-topic question unilaterally closed and migrated by a moderator?